ON THE FRONT: 2014 World Fantasy Award Nominee! Heard the terrific news this morning via social media (thank you, Kimm Antell and Charles Tan). Wow -- grateful and honored to be a World Fantasy Award nominee for Artist, along with Galen Dara, Julie Dillon, Charles Vess, and Zelda Devon!! I'm grateful to the WF jury and voters for selecting my past year's labors as being amongst some of the very best books, works, and makers in fantasy. I owe this honor to the work I did on Loteria in 2013. It's been a learning experience as I slowly evolve from the status of a creative, into a creator. The journey is ongoing, and it's filled with peril and challenge. I'm committed to this work, body and soul. The first Loteria art was unveiled last year, via my Kickstarter campaign for the 2014 Calendar. This ongoing series will eventually be fifty-four new artworks inspired by Loteria -- the classic Mexican game of chance played much like Bingo. This is only the tip of an amazing rhizome that keeps surprising me, as the series unfolds, with more works to be unveiled before the end of this year. 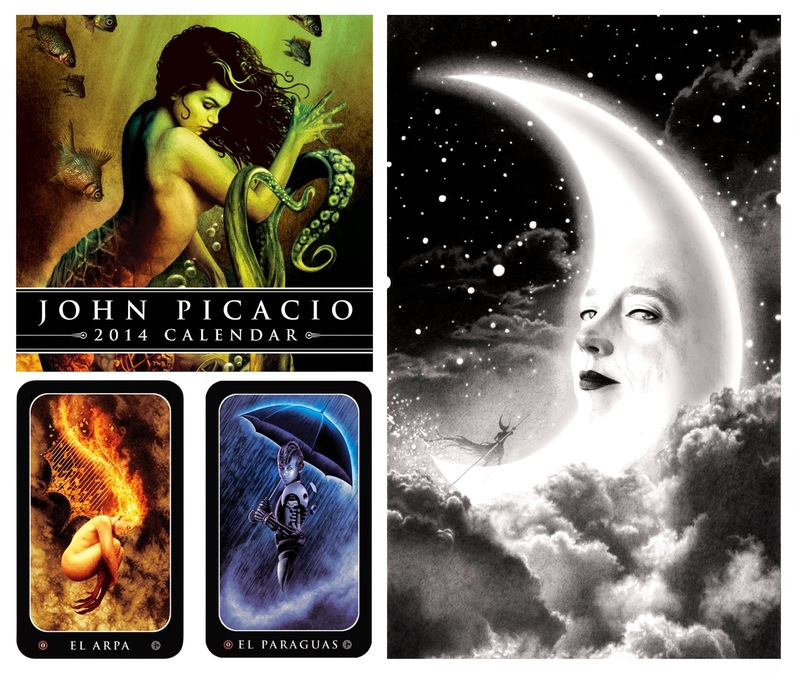 Pictured here, clockwise from top left: the cover of my 2014 Calendar (featuring 'La Sirena'); the pencils for 'La Luna'; 'El Paraguas' and 'El Arpa', as seen on their limited-release Loteria Grande prototype cards. Eventually, Loteria will be an official game, card deck, and so much more, but before any of that happens -- it will be a major book release. Right now, I'm shopping for the right publishing partner. 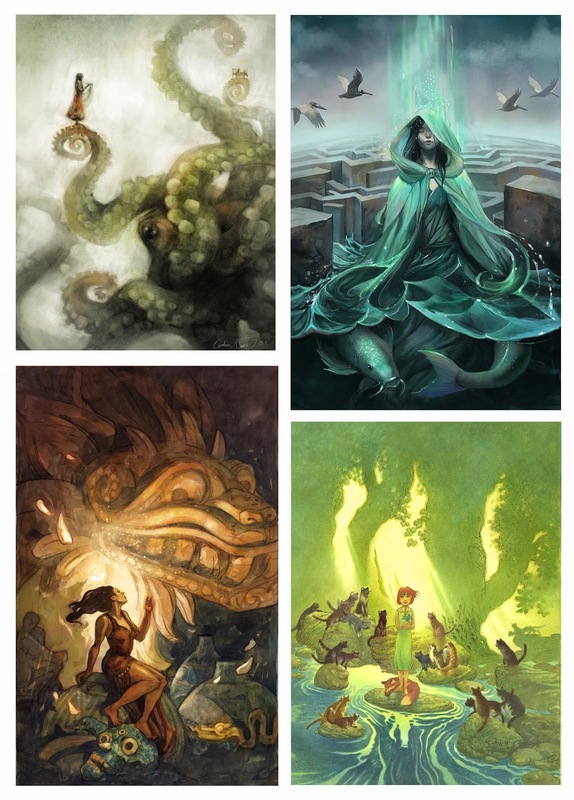 Of the completed Loteria works, 'La Sirena' has already scored a Chesley Award, and 'El Arpa' and 'La Luna' were recently announced as finalists for this year's Chesley Awards. I'm extremely grateful that these individual works are connecting so quickly with so many, and I think this World Fantasy nom is especially meaningful because it acknowledges the first glimpses of my creator-owned body of work. There are so many friends and colleagues across the nominee list that I wish to congratulate, and there are almost too many to name without listing the whole nomination list. I have to give a huge shoutout to Irene Gallo though. As most know, she's Tor's queen of Art Direction, and the Associate Publisher of Tor.com. She's a tireless champion of art and artists. She pours herself into the field, and this is her first World Fantasy Award nomination. I'm really thrilled for her. Back to work here for me. Again -- huge thanks to the World Fantasy Awards jury, and to the voters. I'll see you in Washington D.C. for the 40th World Fantasy Convention! I've loved the Loteria art! I can't explain why I love El Pescado as much as I do, but every piece is amazing. What gets me most is looking at the traditional cards and thinking, "How does one even begin interpreting that?!" and then you reveal a new piece and amaze people. I'm happy for you getting another nomination for a great award, but I think I'm happiest that you're having such a great time doing your own thing this past year! Mair -- And you're gonna end up being a part of it. ;) You're the best! Thank you!